My Blog seems to be full with reviews of Soaps.... Haha... I still have a shelf full of soaps to be used and reviewed! Handmade/ Natural Soaps have made a huge difference to my skin... and it feels good use products on my skin which are not loaded with chemicals. 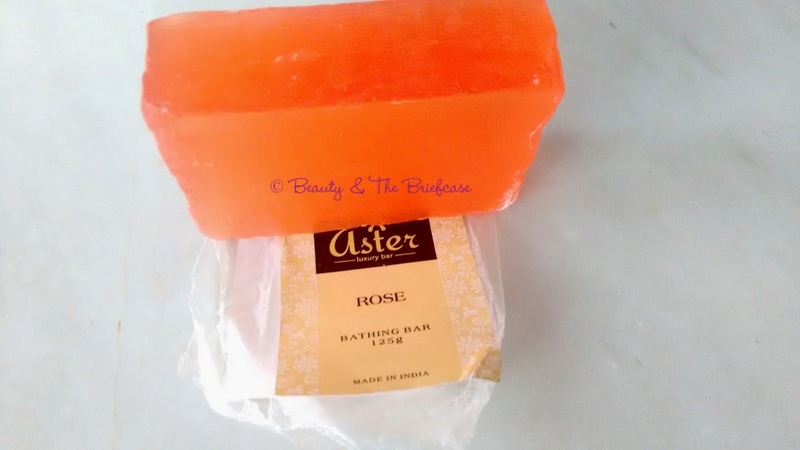 Today i'm back with a review of a lovely soap from the house of Aster. 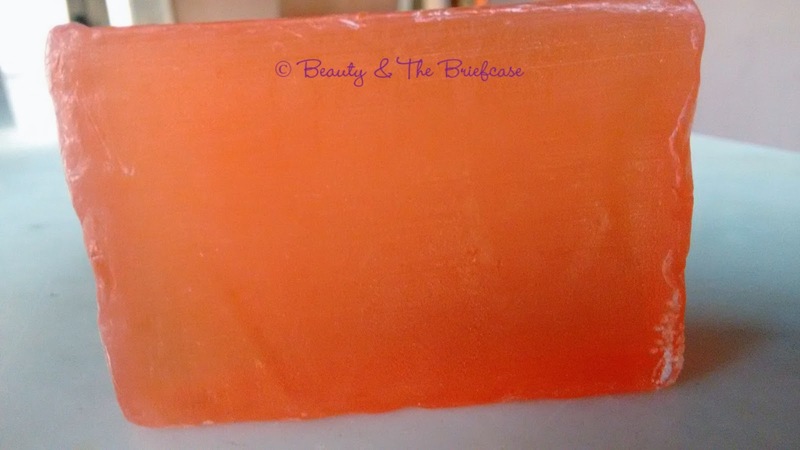 Have you read my review of the Sandalwood Soap from Aster? If not... Check it out HERE. Aster Luxury handmade bathing bars are premium bathing soaps which are designed for those who nourish their skin naturally. Aster bathing bars are blended for enhancing specific skin types, as every individual's skin is not the same. These luxury soaps are skin healthy, soothing and provide natural protection to the skin. Aster bathing bars retain all the possible benefits of herbs and essential oils. 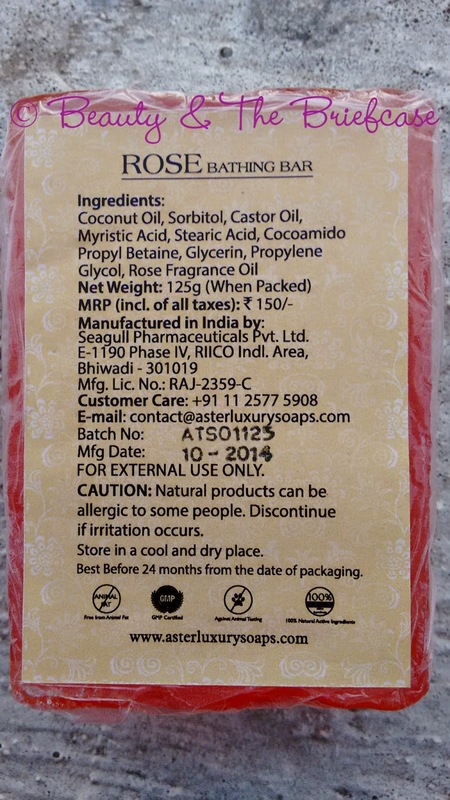 Aster luxury handmade soaps use natural ingredients such as Coconut Oil, Sorbitol, Castor Oil, Myristic Acid etc. The Essential Oils & Fragrances used in Aster Luxury bathing bars are sourced from authentic manufacturers & used only after going through stringent quality control methods. Aster handmade soaps use strong percentage of essential oils thus the lingering fragrance lasts much longer. They have developed a vast range of premium quality soaps both in transparent & opaque form. 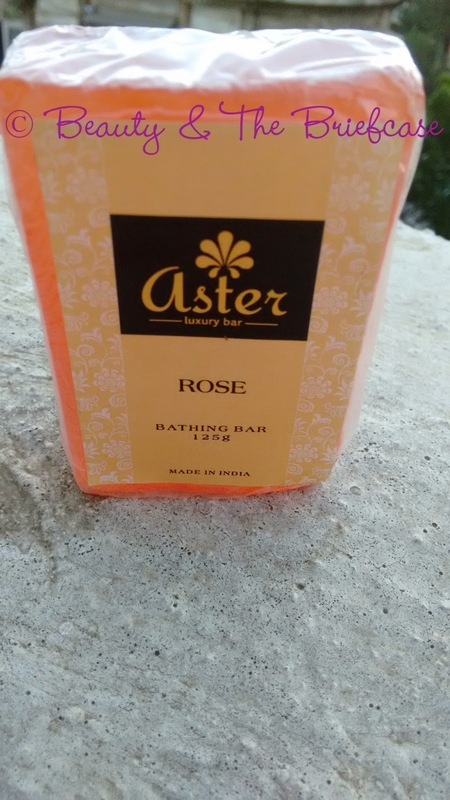 Aster Luxury premium rose handmade bathing soap bar are made from premium quality ingredients and blend of pure essential oils and rose petals. This soap bar has a romantic and aromatic fragrance. Its cooling and refreshing properties cleanse the skin naturally and leave your skin soft and supple. It contains no harsh chemicals hence it is perfect for sensitive, dry or oily skin. No Paraben. No Phthalates. No animal testing. 24 months from date of packaging. Aster Luxury soaps come in a plastic packaging with labels in the front as well as back. The label at the back gives you details of ingredients, manufacture date,etc. Its a very simple and fuss free packaging, but the packaging doesn't go with the brand name. I would have definitely preferred a slightly better packaging. The soap is semi - opaque and reddish pink in color just like a rose. I'm a sucker for soaps with amazing fragrance, but unlike the sandalwood soap this doesn't have a very strong fragrance :(. Its pretty mild so its great for people who don't like their soaps to have a strong fragrance. This soap contains the goodness of coconut oil, castor oil & glycerin... all of these are doing wonders for my skin. Another amazing fact is that unlike other handmade soaps.. this doesn't melt too fast nor does it loose its shape. It lathers really well and cleanses the skin completely. The soap is highly moisturizing and i don't feel the need to apply a moisturizer. 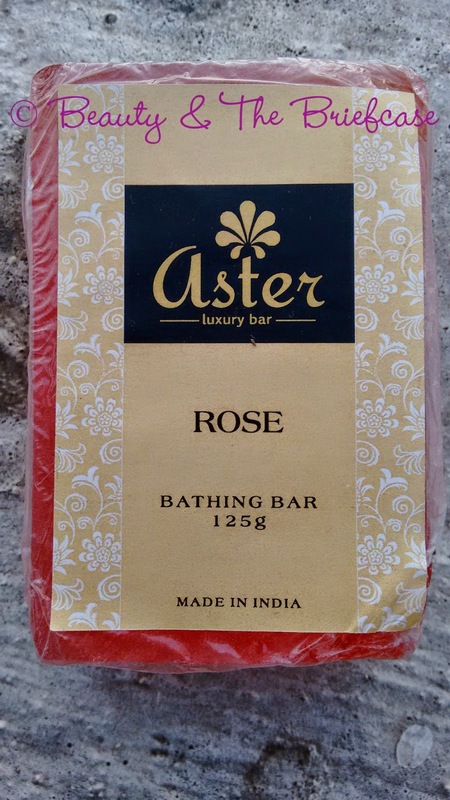 Aster Luxury Bathing Bar - Rose is a great soap for all skin types. Loving the nourishing effect it is having on my skin. Overall, this soap is definitely a winner in my eyes. Honestly, I have enjoyed using both the soaps from Aster. Have you tried their soaps?? If yes, which one. Don't forget to comment below. I liked it more than the sandalwood one . I also liked there coffee soap.